Gerontological considerations aside, a lot of this noise issue on TV can be addressed by different microphone placement and EQ. The clip below has just a simple iMovie treble boost and it sounds much better, proper work by professionals would produce even better results without the need for artificial noisemakers. "I wish I could get it up, but anyway"
How many people in the video room chuckled when he said that? Gotta appreciate that the guy has a sense of humor. Having only watched the Australia race on Speed I think a lot of the TV experience issues were down to the fact that the difference between the noise & the commentary was too great. I'd raise the volume to get more buzz from the cars but then I'd hear the commentary at 2x the volume i wanted. 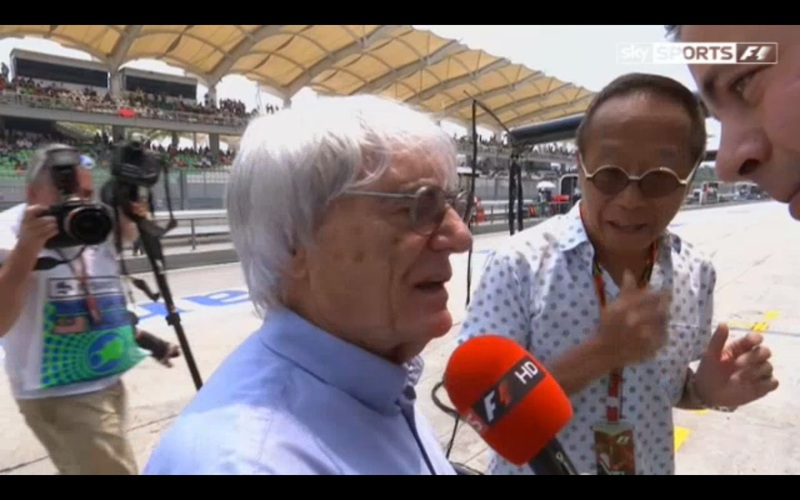 A quick fix would be to just play with level of the commentary being laied over the F1 feed. Oh, man! You just have to love Bernie. Nothing happens by chance in his world. I was watching the Canal+ feed (French) and the world feed (at around 1:06:00 left, so about two and a half minutes after the Sky interview) has Bernie getting door-stepped by a photographer with their "private" discussion quite well heard. Basically it was the photog complaining about the sound in Australia. We are all just puppets in Bernies world! And this sort of thing is why I love F1. As for the sound, I am fine with the sound. you can hear things that you never heard before, like the tires, like the floor scraping, like Bottas' wheel disintegrating in AUS, like the rasping of the stones in the gravel traps. Same issue for me. I kept telling the old codgers on TV to shut up but they kept on yapping! Listen carefully and the lower overall volume of the engine allows you to pick up a lot of nuances - listen to how Rosberg modulates the throttle during the esses toward the end of that lap. I like that you can hear more range and complexity in the audio. "As for the sound, I am fine with the sound. you can hear things that you never heard before, like the tires, like the floor scraping, like Bottas' wheel disintegrating in AUS, like the rasping of the stones in the gravel traps." For TV it barely matters. As you say, just tweek the EQ and commentary levels pre-transmission and it's fine. Of note Rosberg was only running up to 12,000rpm in that clip so wasn't even at 'full noise' either literally or figuratively. While the sound on the broadcast was much better in Malaysia than in Australia, you're 100% correct about simple it is to improve it. At the start of the Australian Gran Prix, it was immediately obvious the sound levels of the cars were too low from the broadcast side. You could hardly hear them over the announcers and anyone who'd previously seen testing footage from Jerez and Bahrain knew the cars sounded much better before Australia. So what happened? …Well I used to work in television, and have directed live sporting events, where they always mic the ambient sound. It's typically referred to as "nat sound" which is short for natural sound. It's an important part of any live sporting event. The sound of players colliding, the crack of the bat or the roar of the crowd; it's a must! One could argue the differences in broadcast was because the television crew in Australia used the same audio levels as in the past, when the cars were much louder, and were just caught off guard. OK… However, all the director had to do was tell the guy working the soundboard to, "bring up the nat sound levels some more" and it would be fixed. So unless the director was a moron, or had a personal beef with the new cars and was trying to make a point; the only thing that can be concluded is someone told them to leave the audio levels turned down during the Australian broadcast. So you have to ask, who has that kind of power? …Let's just say, I find it interesting that previous to Australia, Bernie was bitching about the sound of the new cars being too quiet; then miraculously, as soon as organizers began threatening lawsuits due to the lack of sound in Australia, the cars suddenly sounded better on Malaysia broadcast and Bernie changed his tune… Just saying, the simplest answer is often the right one. I have a sneaking suspicion the sound will be even better still in Abu Dhabi.